Thank you Google translate for that post title…and for everything I said in the Netherlands that wasn’t embarrassed English or panicked German. But we’ll get to all that. Let me give you a short overview first – it’s the now-annual LWAT “What I Did on My Holidays” post. In this one, we cross the channel and not just to the Isle of Wight. I know, exciting stuff. Where else to start but Dover? I’m what you might call a cautious traveller, so we turned up with nearly three hours to fill before our ferry left. It was totally justifiable. We made the fatal mistake of asking the kids whether they wanted to go to the playground first or go and find a cafe for some brunch and inevitably, the vote was split. 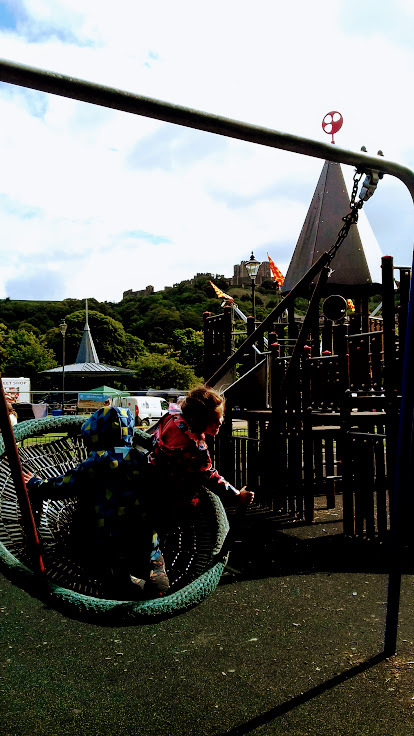 So we gave in to the bolshiest one and started with the playground, overlooked by the majestic Dover Castle (not to be confused with the pub near Nathan’s office) and also by the funfair that was just setting up. Luckily it wasn’t going to open for quite a few hours so the kids didn’t have a chance to drain all our cash before we’d even left the country, but we did splash out on some pork-related sandwiches and some coffees in a nearby Costa. Nathan was perfectly acting the part of the caffeine-deprived Londoner, standing in the playground whinily asking where the nearest Pret was…so I eventually took pity on him. 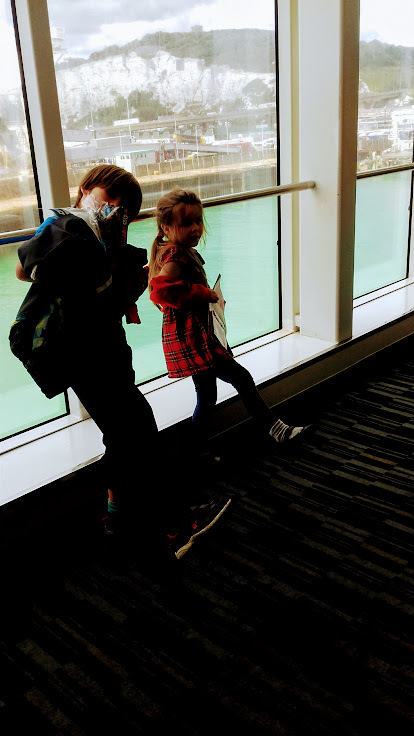 The hours flew by and pretty soon we were on board the DFDS ferry to Calais, with only the briefest of tedious interludes as we queued up for customs. The children initially had some interest in the famous white cliffs, but it diminished after 30 minutes or so of staring at them. So we’ll skip straight to the boat, where Eva is enjoying the pleasures of an on-board soft play. Roo, unfortunately, was a little too big for Adventure Island (6 years and under) but made do with his Lego magazine and a lot of staring at the horizon whenever he felt too seasick. The journey lasted 90 minutes, though we were an hour further on than that once we disembarked, thanks to the time difference. We’d claw that hour back on the way home and trust me, we’d need it. 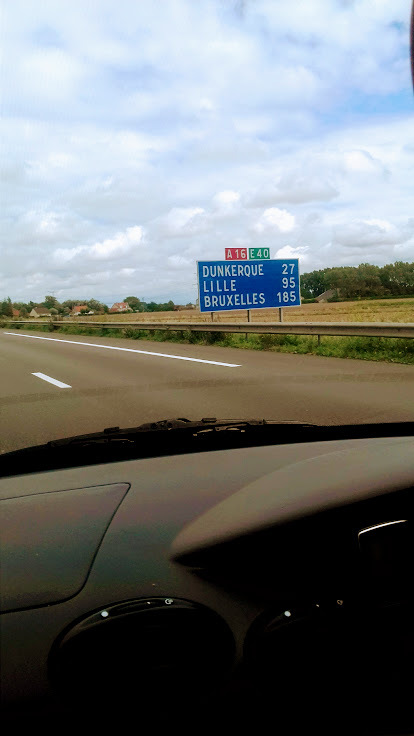 We were cautiously following Maria’s directions of “drive up the coast, turn right at Ostend, head to Brussels” but it couldn’t really be that easy, could it? Especially as this was the first time Nathan had ever driven on the right? Well, it was fine. Improbably so. The kids were quiet, the junctions were smooth and once we got on to the motorway the next turn was 173km away. We got through France on the 130km/hr roads within about half an hour. We turned right, just as Maria had said and then there was Brussels. There was a little navigating to do as we joined the Brussels Ring but the lanes were well marked and instinctive and there was always a decent amount of slip road. I wonder how the poor Belgians fare on our chaotic roads when they drive in the UK? 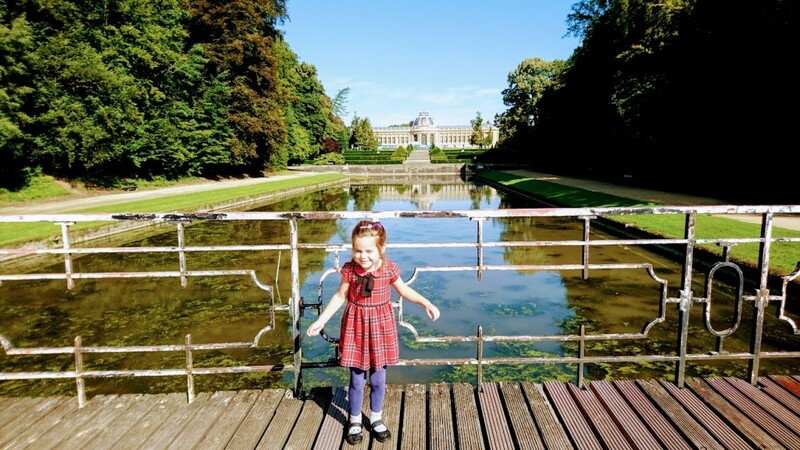 The only glitch-ette we found was driving through towns once we’d turned off the E40 – 200km of motorway driving had made Nathan a little complacent and we’d forgotten that we still hadn’t the slightest clue about traffic lights, roundabouts, zebra crossings and provincial Belgians. But we arrived at Casa Maria safely and a splendid weekend ensued. Last time we’d visited, we’d been to the bright lights of Brussels itself, taking in the EU and a lot of trams. This time we pottered around the local area a bit more, visiting a great adventure playground at Kessel-Lo, complete with high ropes, cafe and kissing gnomes: Just don’t forget that you need to pay 3Euros in change to get out of the car park – a bit of a challenge when you’re new to the area like we were. Luckily, the Marias came back to rescue us. Later, Maria and I went to pick your own vegetables where I (briefly) got my hands dirty extracting a lettuce and learnt a bit about nature and gardening stuff. 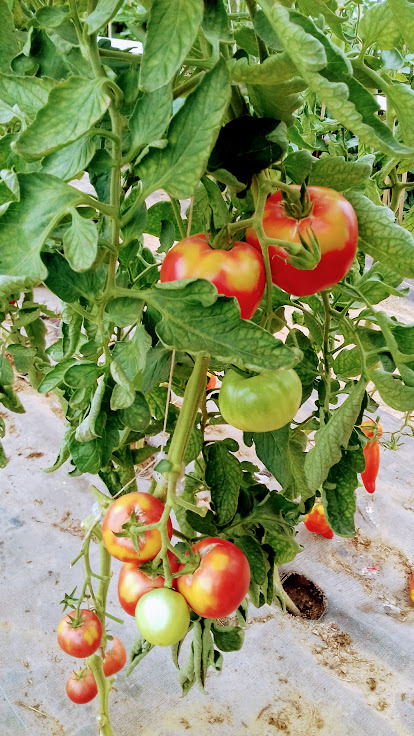 For example, I can now identify this plant as a tomato plant. Aced it. 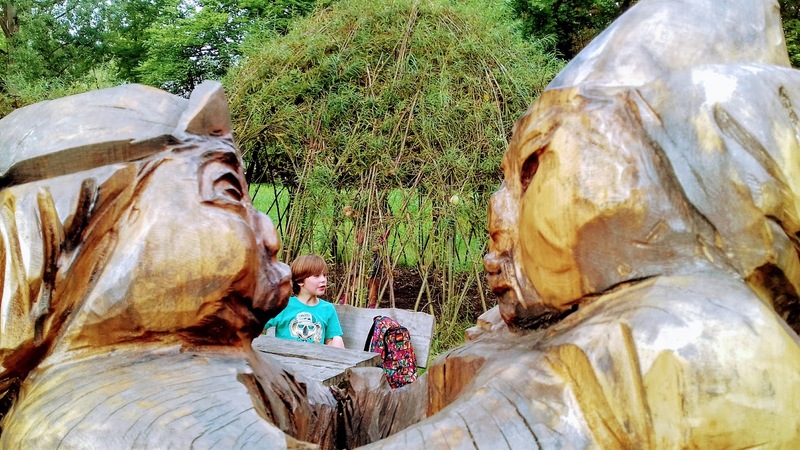 The next day we were driving on to Centre Parks in the Netherlands but we just about had time for a den-building date with some imaginary friends in Park de Tervuren. 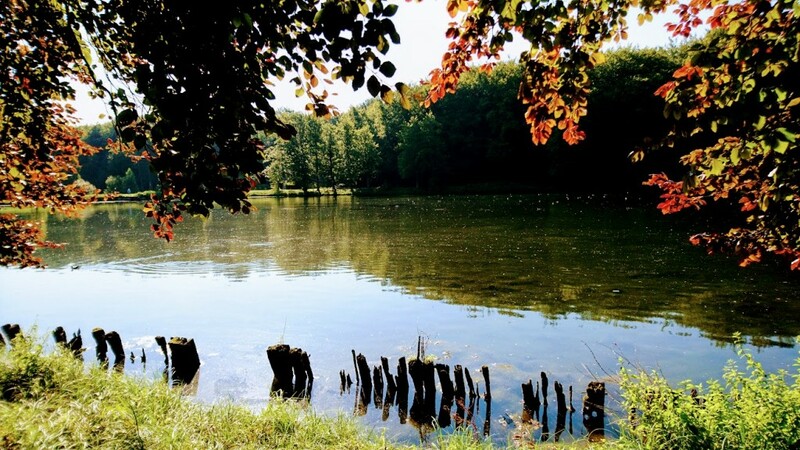 “Park” is a bit of an understatement for what it is – it’s a huge natural area, with woods and lakes and tree-lined boulevards. Quite lovely. And then on to our holiday home stopping only at a service station to use the loos. More Euro change needed. Some frantic change-making in the attached store. And then some meatballs and pommes frites. I knew our destination wasn’t terribly far into the Netherlands but even I was surprised when we reached the turn off six minutes after crossing the Dutch border. To be precise, it was the whole of “Belle” and a few minutes of “Man or Muppet?”. So we’d driven in three countries to get to Center Parcs de Kempervennen but we spent three times as long driving through the car park as we did driving on the Dutch roads. Eventually we turned the engine off, put “Gracelands” on and waited to check in. And what we did at Centre Parks? Well, that’s another *thrilling* installment that’s coming up soon. No, do not leave that seat-edge…. 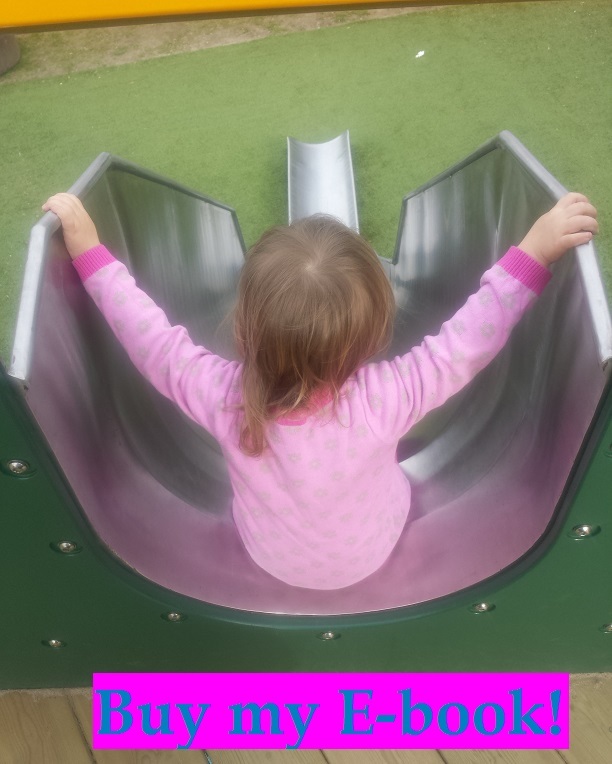 This entry was posted in Creating precious childhood memories or something (days out) and tagged Abroad, holidays. Bookmark the permalink.